Detectives investigating lurid abuse allegations against Sir Edward Heath have interviewed key figures at Private Eye – because the satirical magazine joked about his sexuality 40 years ago. Police even visited the current editor, Ian Hislop, to ask what he knew about the former Prime Minister, despite the journalist being a teenager during the period under investigation. Officers have also tracked down former Downing Street staff to ask them if young men were ever sneaked into Number 10. Wiltshire Police’s controversial inquiry into Heath – Operation Conifer – has now cost taxpayers almost £900,000, with 17 people still working on it, despite growing demands for it to be shut down. However, Chief Constable Mike Veale has apologised to MPs and peers for the operation being launched in front of cameras outside Heath’s former house. In the latest example of what has been branded a farce, Wiltshire Police rang former Private Eye editor Richard Ingrams earlier this month because the journal often made jokes at the expense of Heath when he was PM from 1970 to 1974. Unmarried Heath had been jokingly dubbed ‘Sailor Ted’ in a reference to rumours that he was gay. ‘The policeman said he wanted to know whether I had any information on Mr Heath,’ said Mr Ingrams. 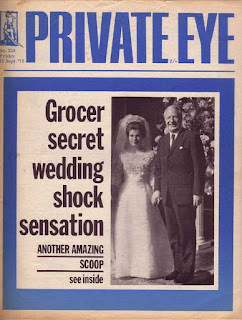 He added: ‘I told the policeman there was a general subject of speculation about whether the Grocer [Private Eye’s nickname for Heath] was gay or not. He had a dislike of women. He was very rude if he was sat next to women at lunch parties, just ignoring them completely. PS Richard Ingrams is a homophobic shitbag.